Service Costs > How Much Does a Watch Battery Replacement Cost? When your watch battery dies, you are going to have two options for replacement: either taking it to a professional or doing it yourself. However, if you have a watch that is worth hundreds, if not thousands of dollars, it may be ideal to take it into someone that knows what they are doing. The cost of having a watch battery replaced will depend on the watch brand, type of battery, and the professional performing the job. On average, most professionals are going to charge around $5 to $14 to replace a basic watch battery, but this can greatly vary depending on the brand and type. Watches with a water resistant battery can cost $40 to $65, whereas chronograph models can cost as much as $65 to $100. With so many watch brands on the market, we created a table of the prices we had found online. For instance, popular watch retailers, such as Sears, charge $15 to replace watch batteries. Discount retailers like Walmart charge as little as $5. On this QVC.com forum thread, for example, members claimed they paid anywhere from $2 to as much as $20 to have their battery replaced. Most recommended that you check out your local jewelry store or places such as Sears, JCPenney, and Walmart. This Yelp forum thread had members saying they had paid anywhere from $2 to as much as $10 for their watch battery replacement. Usually, any place where you can buy a watch will have a repair specialist on hand to perform any necessary repairs such as shortening watch links, swapping batteries or doing basic repairs. When the watch battery is replaced, the watch will be turned over and the backing will be removed. It will either be removed using a small flat-headed screwdriver or a small screwdriver, depending on the watch brand. Some backs are simply pried off while others have screws that hold them on. 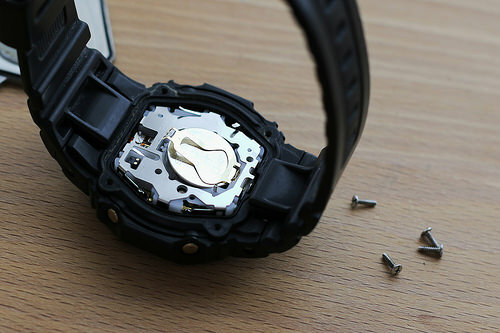 Once the watch is opened, the gasket will carefully be removed and set aside. When the battery is exposed, it will be removed using a smaller screwdriver. After the battery is successfully removed, the new battery will be installed and the backing will be put into place. The watch will then be set to the current time and date. The length of time that the watch battery lasts will depend on the type of watch and its functions. For example, if the watch can tell the time, date, act as a stopwatch, and other functions, the battery will not last as long as a watch that just keeps the time. However, most watch batteries will last around four years. Some companies may provide a limited warranty after a watch battery has been replaced. Sometimes, a watch can die due to a faulty gasket. If this is the case, this can cost around $10 to $20 to replace. Try to avoid the discount retailers and consider doing to a local reputable jewelry store. Even if they cost a few dollars or more, this difference is often worth it. If replacing a watch battery yourself, be very careful with crystal backings. If too much pressure is applied, the back can crack. A watch can lose its water pressure after it has been opened up. A good repair specialist will be able to pressurize the watch. Mercury watches can last about three years, but they provide very consistent voltage and, therefore, keep the time accurately. Silver oxide batteries are just as powerful as mercury batteries, but they are smaller in size. You will only be able to use this type of battery in a watch that is made for it. Lithium watch batteries are the most common and are sometimes referred to as “coin batteries” because of their shape. These batteries can last up to ten years and are not harmful to the environment like mercury batteries can be. Alkaline batteries are the second most common type of watch battery. These are the cheapest batteries you will find, but they also have the shortest lifespan, lasting as little as a few months. Take your watch to the jewelry store where you purchased it. Some places may be able to give you a deal or even replace the battery for free. Changing a watch battery is not that hard to do; however, if you do not want to risk damaging your watch, do not attempt it. Replacement watch battery kits online generally sell for less than $10. Some stores may be able to do the change for free. This gimmick is done to get you to come shop with them in the future. Keep your eyes peeled for special promotions or sales.